I had an opportunity to attend the November 14, 2016 CTA Board meeting and testify during the public hearing on the 2017 budget. There were 5 people from the NLCCC in attendance including myself. Three of the 5 were from the Transportation Subcommittee, and 2 were from the Economic Development Subcommittee. I didn’t have the opportunity to prepare written testimony, but I will share my recap below. I introduced myself as a member of the North Lawndale Community Coordinating Council, a group charged with facilitating community planning for the North Lawndale community. I indicated that this was our first comprehensive plan in 58 years, and that transportation is an integral part. We are working with CMAP, and that, while we have not yet begun planning in earnest, we have received a draft of our existing conditions report. Data gleaned from the report suggest that between 2010 and now North Lawndale ridership on the Pink and Blue lines increased at a significantly faster level than the citywide average. North Lawndale ridership on the Pink Line increased by 26.2%. Blue Line ridership from North Lawndale increased by 19.4%. Citywide, ridership increased by 14.6%. In spite of the fact that ridership in North Lawndale grew faster than city averages, 9 stations were closed on the Blue Line east of Austin, 5 of which serve North Lawndale, Austin, East Garfield Park and West Garfield Park. (Figures on closed stations from Thom Alcazar, a local business owner who is looking to open a new grocery store on the West Side). CTA has effectively created an express line where they “fly over” predominantly African American communities on the West Side, while providing local service to communities beyond ours to the east and in the Western Suburbs. We admonished the CTA Board that, while they lobby for increased state and federal funds, they also address the apparent inequities in their transit service to local communities. We respectfully requested that the closed stops be restored, particularly in light of our planning process, and the Mayor has designated one of our industrial corridors as a Manufacturing Growth Zone. You can’t attract employers that will hire locally if local residents can’t access public transit near work in their own communities. There have been a number of developments along Ogden Avenue that were not in place when the service was cut. Impacted businesses and institutions include local schools (Collins, Crown, Legacy), Mount Sinai Hospital, Cinespace, Lagunita Brewery and Lawndale Christian Health Center. Residents have been cut off from efficient and safer routes to work, school and recreation. We respectfully requested that the Ogden bus line is restored to where it was before it was shortened. This would mean that the bus would run as far west as Pulaski, and turn around at the Pink Line Pulaski stop on 21st and Pulaski. We expressed thanks and appreciation for programs like Second Chance, that provides training and employment opportunities at CTA for ex-offenders. (NLEN is a partner). However, we requested that CTA work with local community organizations to create opportunities for adults who would like to re-tool their skills and change careers. We also asked them to work with local schools to develop a curriculum and training programs to prepare our youth to work for CTA upon graduation from high school. We noted that CTA is hosting a large scale city-wide procurement fair on November 15th at the Chicago Cultural Center Downtown. We asked the CTA Board to host a similar event in North Lawndale and offered to help coordinate it. We indicated that we wanted our focus to be employment (for people including ex-offenders, college graduates and career changers); procurement for small businesses and opportunities for local artists to have their work commissioned for bus and train stations. In closing, we asked for a meeting with staff to share our plans and how we can incorporate transit into our strategies. We were referred to Jeffrey Wilson, who works with CTA Intergovernmental Affairs. After the meeting, we were approached by Rev. Johnnie Miller to discuss our concerns in more detail. I will debrief with members of the Executive Subcommittee and the Transportation Subcommittee, and set up meetings with Rev. Miller and Mr. Wilson. Photo credit: Norvell Tolbert. Left to Right: Angelique Orr, Mark Ferguson, Valerie F. Leonard, Rodney Brown, Dr. Dennis Deer. We thank the Austin Weekly News for their coverage of the New Covenant CDC Game Changers Award Dinner. The following article appeared in the November 2nd issue of the newspaper. Long-time North Lawndale community activist and community development consultant Valerie Leonard received the first-ever Game Changer in Community Service Award on the evening of Oct. 27. This was one of the several awards that were given out by the Homan Square-based New Covenant Community Development Corporation at its third annual Game Changers for Economic Impact gala. The event was held in Austin’s Columbus Park Rectory, 5701 W Jackson. The awards usually go to innovative North Lawndale businesses, but this year, the NCCDC decided to add an award to recognize those who work hard to improve the community. As the NCCDC officials readily admitted, there was never any real question as to who this year’s recipient would be. Leonard has been working to help North Lawndale for the past few decades. According to the bio on her official website, she founded the Lawndale Alliance, which has advocated for school improvements, fairer Tax Increment Financing fund usage and aid to homeowners affected by the 2008 mortgage crisis, among other initiatives. Most recently, Leonard became one of the three co-founders of the North Lawndale Community Coordinating Council, which is working to create a comprehensive development plan for the North Lawndale community. Dennis Deer, a fellow NLCCC co-founder, serves as a NCCDC’s president. As he explained in the opening remarks during the gala, the organization has been around since 2012. The money raised from the gala, Deer said, will allow NCCDC to offer classed provided by its Small Business Development Center for free. NCCDC also launched the North Lawndale Chamber of Commerce. Deer said it wasn’t the first time someone tried to create one, but this one has survived the challenges so far, and he was optimistic about its future. “We have 15 to 20 members already who are having a unified voice in the development of the community,” he said. As NCCDC director Angelique Orr explained during the gala, the Game Changers awards are meant to do more than recognize local businesses. Deer said that NCCDC wanted to give Leonard an award to recognize how she changed the community, even though she isn’t a business owner. NCCDC Vice-President Rodney Brown offered his own praise. “She has the hart and passion for making sure things get done for the people who need it,” he said of Leonard. Deer said that Leonard wasn’t told she was getting the award until she arrived at the gala. When she came up to the podium, she found herself at a loss of words. The procession of honors for Leonard, however, won’t end with NCCDC. On Nov. 2, she’ll be recognized by the Chicago Chapter of the Social Enterprise Alliance for her work in social enterprise during a session held from 9 a.m. to 11 a.m. at Sankofa House, 4041 W. Roosevelt Rd. Entrepreneurs who won the awards this year included Katros Consulting firm founder and CEO Lynn Sutton; Landon Williams and Jason Diggs, co-owners of Against the Grain Designs accessories maker; Elliot Porter, owner of the Grade A Car Spa car wash; and Michelle Sharp, owner of the It’s-Sooo [sic], an all-natural clearing products company. We thank Charles Paidock of the Citizens Taking Action for transit dependent riders, for sharing the following announcements. A citizens advocacy group for transit dependent riders in the Chicago, IL metropolitan area. The North Lawndale Community Coordinating Council’s Capacity Building Subcommittee today held the second of a two-part workshop on parliamentary procedure at the Sankofa House, located at 4041 West Roosevelt Road. The first session was held a week earlier. “It is very important that we develop our leadership within the organization and the community”, said Annetta Wilson, the chairperson of the NLCCC Capacity Building Subcommittee. “One of the greatest areas of impact is in running meetings, and establishing order. You can get so much more accomplished when you understand how to run a meeting, and there’s a whole lot more to that than getting a b bunch of people in a room together”, Wilson said. The workshop was facilitated by Elaine L. Johnson, the Vice President of the Illinois Association of Parliamentarians, and President of the Mattie Lampkins Parliamentary Unit here in Chicago. The curriculum for the first week covered the governing documents, Robert’s Rules of Order, and the various types of business meetings an organization could have. The curriculum for the second meeting went into more detail concerning the composition of the bylaws, the types of motions one makes to keep meetings on track and the importance of meeting minutes. “I have been in a position in which I have had to use parliamentary procedure for a significant portion of my life, and I still learned something”, said Charlie Wilson, the President of Men Making a Difference, and a member of IBEW. Learning parliamentary procedure could be useful in a number of settings, including block club meetings, church auxiliaries, corporate and nonprofit boards, elementary and high school clubs, et cetera. To learn more about the National Association of Parliamentarians, the Illinois Association of Parliamentarians, the Mattie Lampkins Parliamentary Unit, or their upcoming meetings or events, contact Elaine Johns at eljohnson8@juno.com or 708-336.0058. We thank the Austin Weekly News for publishing the following letter to the editor. Photo credit: Second City Cop Blog. The Mayor has proposed the new $100 million Community Catalyst Fund designed to invest in businesses in communities that are most in need. A governing board consisting of the City of Chicago CFO, City Treasurer, Commissioner of Planning and Development, and four mayoral appointees will establish investment criteria and policies with input from an advisory council consisting of two aldermen and three community representatives. The targeted communities and manner in which investment decisions will be made are yet to be determined. We, the members of the North Lawndale Community Coordinating Council (NLCCC), support the overall concept of the Community Catalyst Fund, and would encourage the team responsible for the implementation to solicit further input from local communities as the program is finalized. This will only strengthen the program. 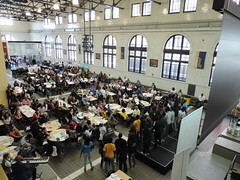 NLCCC is a group of North Lawndale stakeholders, including nearly 300 community-based organizations, business owners, elected officials and individuals that have come together to guide our community’s first comprehensive planning and implementation process since 1958. We believe that there should be representation from Chicago’s West Side on the Community Catalyst Fund (“the Fund”) governing board as well as the advisory council. In times past, the West Side has been excluded from a number of the City’s innovative economic development programs, and we are under-represented on the governing boards for various City commissions. It is important that communities that are in most need also have a voice at the policy level to ensure that programs are responsive and deliver the maximum impact. There is no one-size-fits-all solution to small business development, and every establishment is different. The Fund should take a comprehensive approach that will tap into a variety of public and private resources to provide a broad array of financial products and services to small businesses that are at varying stages of development, from start-up to mature. Examples include low interest micro-loans, New Markets Tax Credits, mezzanine debt and equity investments with longer investment horizons. At the same time, the Fund should provide funding for community-based CDFI’s (community development financial institutions), SBA-certified Small Business Development Centers and other intermediaries to provide technical assistance to small businesses seeking funding in order to minimize investment risk. The Fund’s board should develop investment criteria that are more flexible than conventional financing while safeguarding investor capital, and prioritize projects that will create jobs and provide incentives for hiring residents of the communities in which the projects are located. There should also be accountability to ensure that jobs that are promised materialize. Finally, the Fund should consider clustering public works projects to enhance its investments and spur additional private investment in high need areas. We look forward to an investment fund that will catalyze investment on the West Side, and high-need communities around the City of Chicago. NLCCC, led by our Health and Wellness Subcommittee, will be partnering with the Center for Healthy Work at the UIC School of Public Health, Environmental and Occupational Health Sciences to engage residents of North Lawndale in a 5-year participatory research study through the Center of Excellence for Total Worker Health funded by the National Institute for Occupational Safety and Health (NIOSH) and the Centers for Disease Control and Prevention (CDC). The Center for Healthy Work will focus on the rapidly-growing number of vulnerable workers experiencing significant occupational health disparities in precarious jobs that impact health at and away from work. Precarious work is unstable and uncertain, with irregular, unpredictable schedules, a high risk of unemployment, few economic and social benefits (e.g. a living wage and health or retirement benefits), few protections from labor laws and right, no collective voice in the marketplace a enjoyed by unionized workers, no opportunity or expectation for ongoing employment or advancement to a better job, and low or no compensation for injuries and illnesses. The study will take place in North Lawndale and Little Village. NLCCC will be the lead North Lawndale partner, while Enlace is the lead partner in Little Village. Community stakeholders will be trained in research methods and will identify and prioritize health issues and develop community-based interventions. We are still in the process of fleshing out the details, and will keep you posted of our progress, and let you know how you may get involved. There may be potential overlap with other subcommittees on this project. The subcommittees that immediately come to mind include Workforce Development, Economic Development, Education and Youth Development and Capacity Building. There may also be opportunities to leverage the Quality of Life Planning and CMAP comprehensive planning process, depending on the finalized scopes of each process. We thank Debra Wesley and Tameeka Christian for their leadership in this process. We thank the UIC School of Public Health, Environmental and Occupational Health Sciences for this wonderful opportunity. Alderwoman Emma Mitts and Alderman Michael Scott, Jr. recently hosted a budget meeting so that representatives from West Side businesses, clergy and nonprofit organizations could weigh in on the City’s 2017 Budget. The panel included Andrea Zopp, Deputy Mayor for Economic Development; Chief Barbara West with Chicago Police Department; Commissioner Lisa Butler with the Department of Family and Support Services; Chief Medical Officer Allison Arwady with the Chicago Department of Public Health and Mary Bonome, Deputy Commissioner for Planning and Development. North Lawndale’s own Vance Henry, Deputy Chief of Staff to the Mayor, was also in attendance. Panelists highlighted community investments in businesses, public safety and youth. 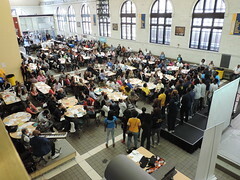 While residents were generally pleased that the City will be making more investments in local communities, participants raised concerns about the need for the investments to more directly impact local emerging businesses, as opposed to only focusing on luring large companies to locate businesses in under-served communities. Participants were also concerned about public safety issues, including greater police coverage in hot areas. We were proud to see a number of NLCCC members in attendance, including Dr. Dennis Deer, Kevin Sutton, Brenda Palms Barber, Richard Jackson, Vincent Guider, Valerie F. Leonard, Richard Townsell and Jesse Green. NLCCC submitted a written request for the proposed Community Catalyst Fund to include representation from the West Side on its investment (governing) board, as well as its advisory committee. We also advocated that the Fund include North Lawndale as a targeted community and that investment policies be written in a manner that would also encourage investment for businesses from the community and hold businesess that receive funds accountable for hiring local residents. Other requests included CDBG funding for affordable housing and expansion of community-based mental health alternatives and for the City to replicate the 606 Bike Trail in North Lawndale. We will be meeting with representatives from the City to discuss our proposal in further detail in upcoming days. We will be amending our proposal to include youth mentoring and employment. If we need to expand our proposal in any other way to focus on issues you deem important, please contact Valerie F. Leonard at consulting@valeriefleonard.com; Dennis Deer at drdeer@deerehabservices.com or Rodney Brown at rodney@new-covenantcdc.org. The Chicago Chapter of the Social Enterprise Alliance will be providing a technical assistance session and recognizing Valerie F. Leonard for her work in social enterprise on Wednesday, November 2, 2016, from 9:00 am – 11:00 am at the Sankofa House, 4041 West Roosevelt Road. Annetta Wilson is the Executive Director. This session is free, and is intended for small businesses, nonprofits and anyone who is interested in social enterprise. Outlined below is a project description. Do you want to learn how to grow your organization or community using existing resources? Do you want to learn more about resources that are available to you? Jesus “Chuy” Garcia gives the opening remarks as a charismatic public figure who has advocated for social justice all throughout his career. We will be honoring Valerie F. Leonard for her excellence in social enterprise work! SEA will close with questions from the audience and time to network and get to know each other. Michael Hyzy will be moderating the event and taking any questions beforehand. Refreshments will be provided. We thank Ms. Annetta Wilson, Executive Director of the Sankofa Safe Child Initiative for hosting the event. We also thank the North Lawndale Community Coordinating Council for providing promotional support. The missions and models module will survey basic principles of social enterprise, with particular attention to social enterprise missions and models. The module will examine strategic elements that strong missions and robust operational models contribute to the operational unity of fee-based revenue and social purpose. Participants will learn: (1) a framework for conceptualizing social enterprise and differentiating it from purely for-profit and non-profit realms, and (2) lessons instrumental to pivoting toward social enterprise operations and strategies in their own projects. The legal design and structure module will include the key legal, tax and financial considerations in launching and scaling a social enterprise, examining in specific: the selection of the optimal non-profit, for-profit, or hybrid legal structure; Benefit Corporations and L3Cs; mission-related, program-related and other impact investment models; and the maintenance of charitable status for non-profit social ventures. The City Council is hosting their annual budget hearings over the next couple weeks. We encourage you to review the preliminary budget and to attend budget hearings and provide public comment during the public hearing on November 1st. Alderman Michael Scott, Jr. , Alderman George Cardenas, Alderman Jason Ervin and Alderman Ricardo Munoz, whose wards have some portion of the North Lawndale community, are all on the City Council Budget Committee. Please feel free to share your concerns with them as well.